However, some have suggested the fundamental problem in the UK housing market is the persistent shortage of housing – and increasing the availability of credit doesn’t directly address this problem. The number of households is forecast to grow by 232,000 a year until 2033, and yet the current rate of home construction is struggling to increase above 100,000 a year. 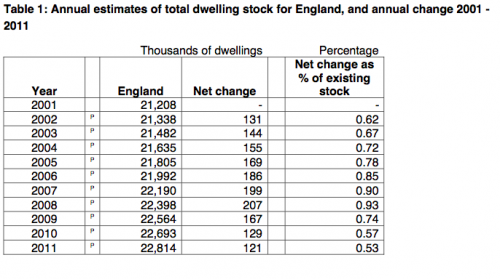 In 2007 the Government set a target of increasing the supply of housing to 240,000 additional homes per year by 2016. 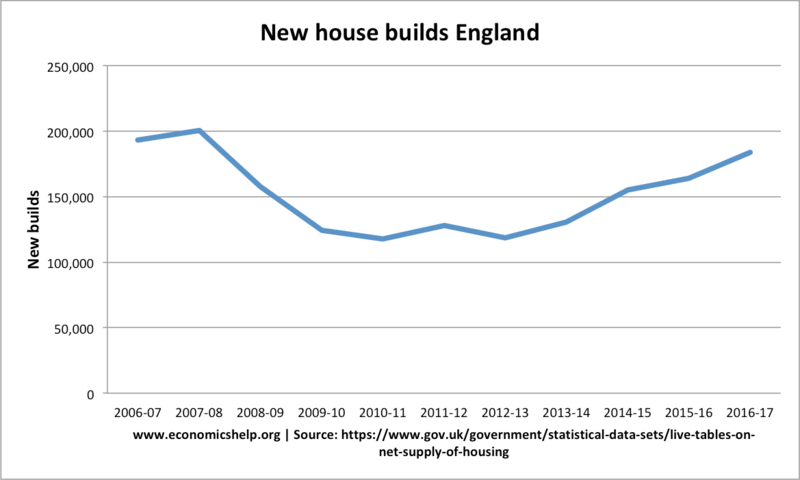 (link) Within this overall target was a commitment to deliver at least 70,000 affordable homes per year by 2010-11, of which 45,000 were to be new social rented homes. However, since the credit crunch of 2008, this target has severely fallen behind as housing construction has slumped. Housing completions have fallen close to 100,000 a year – well below the level needed to meet the growth in the number of households. There is hope improved mortgage availability will increase private sector construction. But, it doesn’t resolve other issues, such as planning regulations and local opposition to building homes on a large scale. Graph showing that demand for housing stock has been growing faster than net additions to the housing stock, pushing up house prices. Despite two housing crashes, real house prices show a remorseless upward trend. The limited supply also tends to make house prices more volatile. Because supply is relatively inelastic a small change in demand can cause a significant change in price. 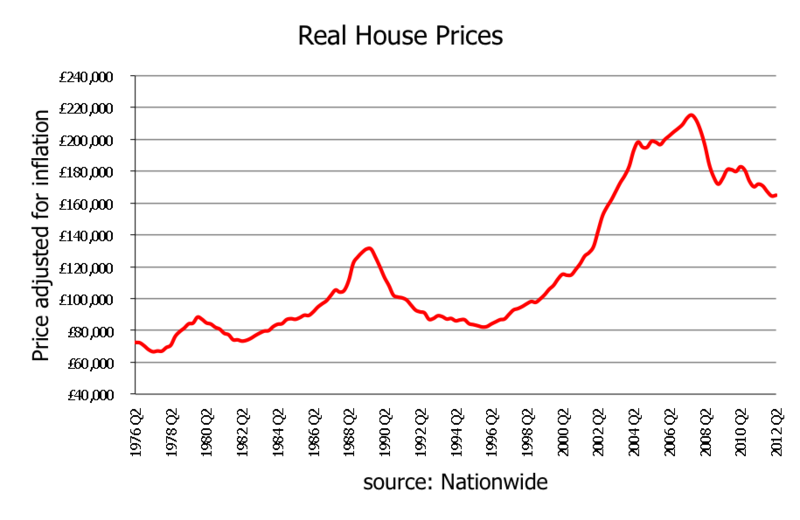 This is a major factor behind the UK housing market’s tendency to boom and bust. 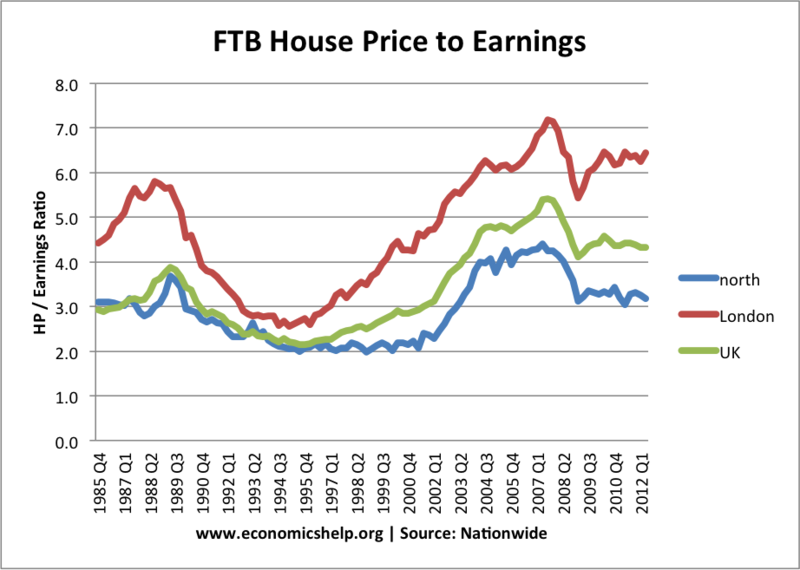 The ratio of house prices to earnings for first-time buyers is already higher than mid-1980s – despite the housing correction of 2008/09. 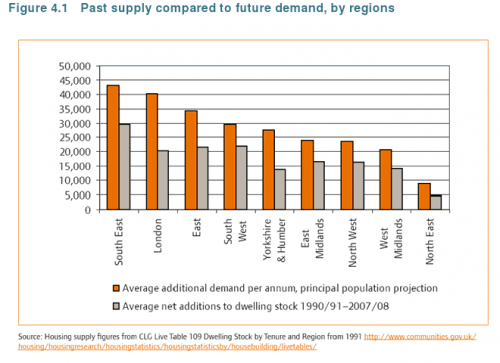 If the long-term trend of rising population combined with limited supply, this is likely to squeeze prices higher. See more at UK housing affordability. 2. 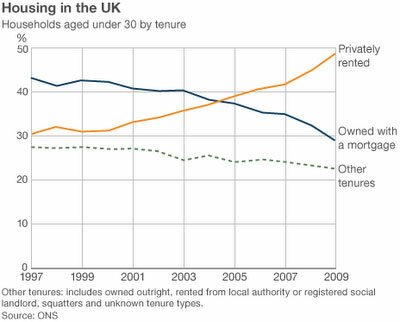 Switch to the private rented sector will continue. If house prices continue to rise, more people will be looking for private rented accommodation. 3. Growth in wealth inequality. Rising house prices benefit homeowners (typically older people). However, it reduces living standards of those without a home. The UK will increasingly become divided between those who own a home and those who don’t. 4. Upward pressure on rental prices. The shortage of housing will put upward pressure on the price of rented accommodation. Housing costs will take a bigger share of people’s incomes affecting their discretionary income.